Despite many mistakes and setbacks along the way, I have managed to amass a small fortune in EVE Online, mostly in Tech II invention and manufacturing. My balance of ISK also jumped upwards recently as a result of some savvy PLEX trading, and also from a few lucky bets on Kelon Darklight and Team Tash-Murkon in the recent Amarr Championships. Over the last few weeks, I've wondered what to do next with my success. I imagine my character, sitting distractedly in his captain's quarters, reviewing his accounts and re-counting his ISK for the hundredth time, and realizing suddenly that success soon leads to boredom, if there are no new goals to conquer. And then I read Proto's latest column on The Neocom blog, and was struck by inspiration. Proto had written his post in response to the recent fluff-up about the failure of the "Fountain War" book campaign on Kickstarter - something I will comment upon in a future post - but that controversy was not what stirred my epiphany. More importantly, Proto makes an excellent point, which is sadly not often acknowledged: There are many, many ways that EVE Online players make a positive and constructive contribution to our community. I will not enumerate the many selfless programs that EVE Online players have established to help people, in game and out, as Proto did an admirable job of doing so already. But as I read his post, I quickly came to the conclusion that I could do something similar, albeit more modestly, and perhaps make a more significant impact on our community. Behold - the Morning Maniac Grant Program! When they have more money than they know what to do with, the idle rich often become philanthropists. I have found myself in exactly this situation, bored and wondering what I shall do to occupy my time in game. But now I feel my interest renewed in EVE Online. I can use my excess funds to give back something, and try to help our player community, at least in some small way. For those who don't know, Morning Maniac was the founder of EVE University. Because of his selfless efforts, I found a place in EVE Online that enabled me to learn and develop the skills and knowledge I needed to succeed in the game. He was one of the most generous philanthropists in EVE Online history, and because of his contributions, thousands of players now fly successfully in corporations and alliances throughout all of New Eden. Inspired by Morning Maniac's example, I have established a program where players can apply for grants of ISK, to fund creative in-game projects. I ask only that grant recipients pledge to help other players or contribute constructively and positively to our community in some way. With this program, I hope to accomplish two goals: help more players to succeed in the game, and also foster a more positive attitude about helping other players in our community. It's a small effort, compared to the success of similar programs with established track records, like Sindel Pellion's Angel Project or Mike Azariah's Operation Magic School Bus, but perhaps it will help enough people to make at least some difference. I'm looking forward to seeing applications from creative capsuleers, and issuing grants to worthy recipients soon! 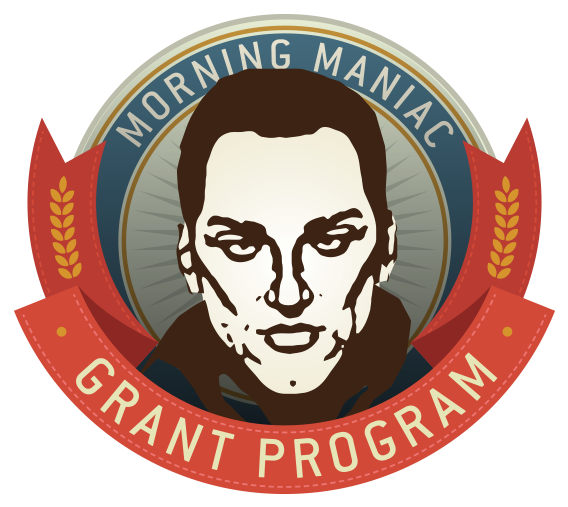 Many thanks to the ever-awesome Rixx Javix for the logo design for the Morning Maniac Grant Program! Posted in Commentary and tagged with EVE Online, philanthropy, Morning Maniac, grant. November 27, 2015 by Neville Smit.